The E4500 Portable Generator from Pramac is a simple, professional generator. Pramac has designed this generator for high performance at an attractive price. It’s powerful, strong, and easy to maintain. 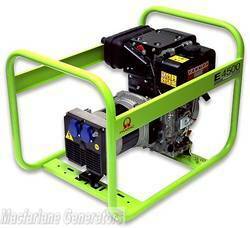 Built with a Yanmar engine and running on diesel fuel, this generator is great for at home or on the worksite. Weighing 54kg, it’s suited for the back of the ute, or in a more stationary position at home.